Coffeetails. Photo by Michael Horne. That closing time happens to be 11 a.m. sets Coffeetails apart from other bars, and disorients some first time visitors, who were planning to get up a good head of steam. The small black box tavern at 1506 N. Van Buren opens seven days a week at 6 a.m. Those customers who are startled to learn the bar shuts down for the day before most bars open are quickly comforted when they are escorted to a short flight of six carpeted steps at the rear of the bar promptly at 11 a.m. The stairs lead directly to the Y-NOT II, with which Coffeetails shares a license and common ownership by Anthony F. DePalma, even though the two taprooms do not share business hours. 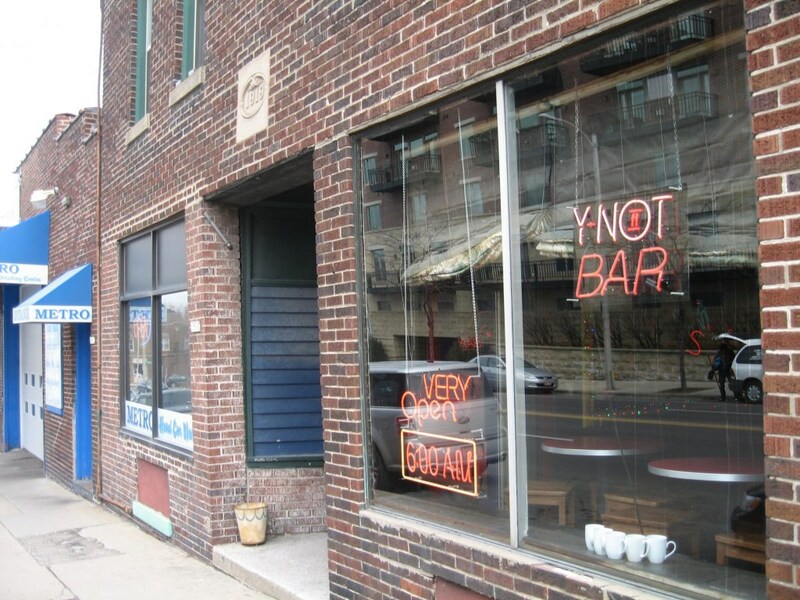 When Coffeetails shuts down for the day, the Y-NOT II opens, and stays open until 2 a.m.
Four hours later the cycle repeats, as it has for some seven years since DePalma decided to open the auxiliary to his main bar, which he has been running since 1971. The place, as you can guess from its name, is a combination of a coffee shop and a cocktail lounge. There is no projecting sign on N. Van Buren St. to announce its presence, which is greatly upstaged by the Metro Car Wash next door. A neon sign on the window says that the place is “Very Open” at 6 a.m., when this tavern stands out like a beacon for the third shift workers and the first shift shiftless. The door itself is recessed and shares its stoop with two other doors, none of which have the attraction of this one, or the wonders beyond. The bar itself runs along the south wall of the space. 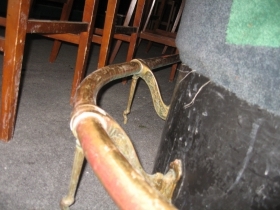 It has a most interesting and quite old brass foot rail as its primary distinguishing architectural feature. The barstools are wooden, fixed, and with backs. A couple of cushioned stools round out the inventory. 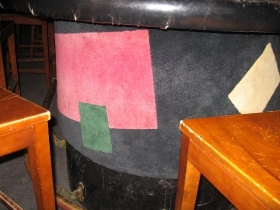 As you sit at the bar, your knees will rub up against its vertical surface, a rather colorful patchwork of old carpet on a black background. The walls are mostly textured panelling, heavily coated with black paint. The ceiling is black as well. So much light is absorbed by the walls and so little reflected that the giant mirror on the south wall is particularly dim for such an otherwise splashy ornament. I rarely bother to gaze mistily into its beauty for more than a few minutes on any given visit. Airplane bottles. Photo by Michael Horne. This, however, is not the darkness of gloom and doom, but more like the darkness of intrigue and neighborhood gossip which flows as steadily as the mini-bottles of Canadian Club whisky, served two at a time. The walls also provide a nice staging area for the many quality neon art sculptures that bring some light into the room. Plate glass windows admit views of busy N. Van Buren St., and the Lyon Court Condos across the street. 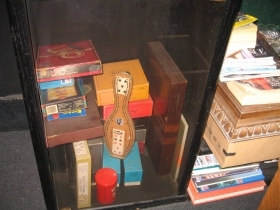 A cabinet holds game boards, including some rather novel cribbage sets. 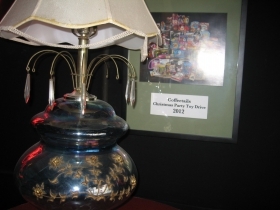 Photographs show the evolution of the Coffeetails Christmas Toy Drive, started some years ago. 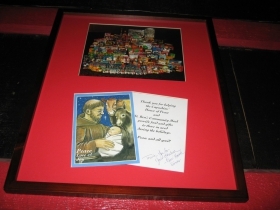 The picture of the 2012 pile of presents is impressive enough, as well as the years that followed, but are insignificant compared to the 2015 toy drive which brought mounds upon mounds of happiness to the children who celebrated at Journey House. One novelty that Coffeetails shares with its sister bar upstairs is the popularity of airport bottles of liquor, served with the mixer of your choice (which is only occasionally coffee). 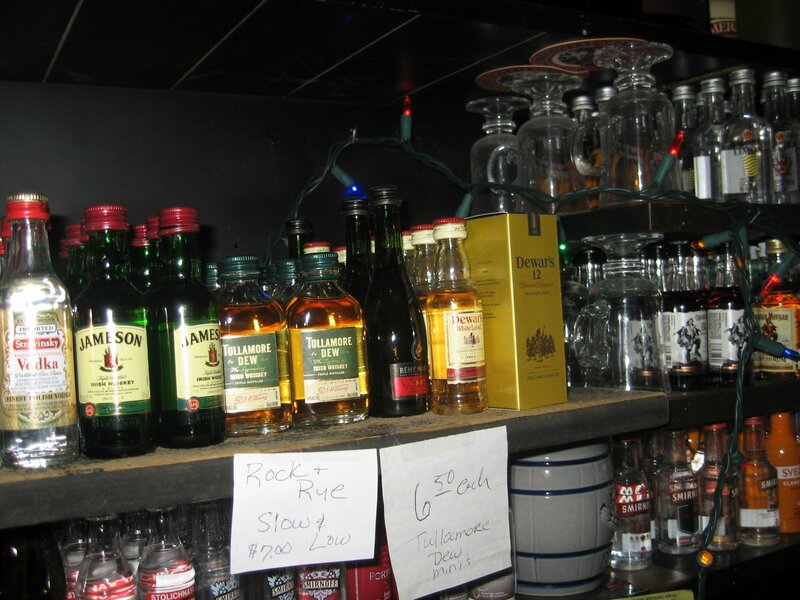 They are arranged near the happy face cup where the bartender keeps paper clips and that kind of stuff. Germaine Bowers does the early shift Thursdays through Mondays, while Alison McCreadie fills in on Tuesdays. McCreadie also pulls some shifts at Conway’s, a bar we have previously examined. Some people here really do drink coffee, since the bag where the grounds are dumped weighs about 30 pounds by the time I haul it to the St. Rita’s Community Garden a block away every couple of weeks. The grounds are composted on the site and are used to fertilize the crops that are donated to the Riverwest Food Pantry throughout the season. 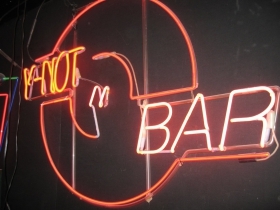 Although Coffeetails is part of the larger Y-NOT II bar, which we have reviewed, its distinct operating hours and character qualify it to be considered as a place of its own, and entitled to be treated as such with its own review. Very often customers of one have no idea the other place exists just on the other side of a door. This can only happen in an urban environment. Masonry contractor Steve Italiano operated his shop from this corner parcel at the northeast corner of what was Lyon and Van Buren streets in the early 20th century. He must have prospered nicely as he took out a number of permits over the course of three years resulting in the construction of the four buildings that comprise this single tax key property. This portion was planned at a cost of $4,000 in the spring of 1919. A stone above the doorway marks the year. As construction was underway, an additional story was built atop the building for a cost of $1,900. In 1920, the 45-foot by 35-foot portion that is now the corner laundromat was designed by the architects Backes and Pfaller and built for $7,500 after being advertised in the American Contractor that April. In August, 1922, Italiano built the “store and flats” that houses the Y-NOT II for $28,000, and at around that time he added the garage that is now the car wash. The buildings are all of solid brick construction, and replaced previous structures that had been described as “old” as early as 1894. Italiano had a competitive advantage over other developers, since he presumably had his own crews doing the mason work. Details, such as the stone date above the door, are rather elaborate for what is described by the Wisconsin Architecture and History Inventory as an “Astylistic Commercial Structure.” Such details, which include concrete urns on the Y-NOT II building and the terrazzo floors throughout may have been a source of pride for the mason / owner of the building. The mixed-use nature of the buildings was a testament to the dense urban fabric along streetcar routes like N. Van Buren St. For decades, from about 1975 to 1995 the corridor immediately to the south had been mostly cleared of buildings for a never-built freeway. The space now occupied by Coffeetails served from 1935 until 1975 as an Italian sausage shop operated by Salvatore Russo. Curiously, the building that once housed its rival Dentice Italian Sausage Shop, a block away at 1600 N. Jackson St., has also become a coffee / cocktail bar. It is called Pleasant Kafe. The building east of Pleasant Kafe, at 1601 N. Van Buren, which houses the Frame and Fabric shop, was built by Italiano in 1928. It includes his name surrounded by two shell rondelles and other detailing, including glazed tile accents around the windows. Since 1958 the building has been owned by Kenneth Eichenbaum, occasionally in conjunction with relatives. A lawsuit over this place was settled in 2015, and Eichenbaum was granted a quit claim deed on August 20th for $660,000. Eichenbaum’s son, advertising executive Steve Eichenbaum, died in October 2015 at 61. Kenneth Eichenbaum is a 1948 graduate of Washington High School. He wrote an amusing account of his life in promotional material for his Hoppel Poppel Kosher Comix. “Today Ken and his wife Dr. Cate Charlton divide their time between Santa Cruz, California where she has a bustling chiropractic practice, and Bayside, Wisconsin, where he conducts his publishing activities under the name of Litterati Books, and continues to do some graphic design work, but mostly for non-profit organizations that couldn’t ordinarily afford his exorbitant fees,” he writes. I will be beginning my 62nd Birthday festivities Saturday morning, February 27th at Coffeetails beginning at 10 a.m., and running until closing time at 11 a.m., at which point the party will migrate upstairs for whatever might transpire at the Y-NOT II. Feel free to come by any time that day, since I plan to stick it out until the night time! Since it is an election year, expect plenty of politicians to make their appearances. Location: 1506 N. Van Buren St. Description: Small bar in a black room was an Italian Sausage shop for decades. One part of a complicated building that includes a car wash, a laundromat and two bars, along with apartments and rooms. Must have a huge water bill. Hours: Whenever the law allows. Sunday – Thursday 6am – 2am, Friday – Saturday 6am– 2:30am. Open 44 hours straight at New Years. Food: Free Popcorn and the occasional 4-star free buffet. Signature Drink: Mini Bottles of liquor, with coffee if you please. Capacity: 100 in 3,297 square feet with two bars. Year Established: Tony has been in business as sole-proprietor for 47 years, perhaps the longest continual ownership among city taverns. This portion first opened as bar in 2008. Upstairs bar since 1934, said to have been drygoods store during prohibition. Large garage and complex floor plan may have hidden some sort of prohibition era illicit activity. Estimated Annual Rent: City calculates market value rent for 3,297 square foot tavern space at $18.59 per s.f.= $61,291.23 per year. Building assessed at $350,500 for the 15,240 square foot lot ($23.00/s.f.) and $969,500 for the building for a total assessed valuation of $1,320,000. Property has consistently increased in value over past decade. Business Owner: Anthony F. DePalma, sole proprietor D.O.B. 11/02/1939. Street Smart Walk Score: 93 out of 100. “Walker’s Paradise” Transit Score 58 out of 100, “Good Transit.” Route 15 outside the door. Games of Chance: Cribbage boards. Mascot: Remy, a white poodle. Short for “Rembrandt,” Remy is successor to the long-lived Ralph (short for “Raphael,”) a 13-year old black poodle which served until his humane death of old age in 2012. These young reporters, such as Master Horne, expose themselves in writing patterns. 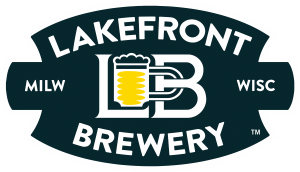 Everyone knows those small bottles are “steamship bottles” and only adopted by the airline industry to meet the needs of a public who can drive around Lake Michigan but need a direct flight to Detroit. I’ve never really frequented Coffeetails (do they have Decaf? ), though you’d think I would have, by now. How was your birthday party, Michael Horne (since I was out-of-town and couldn’t attend)?